The circus animal made a bid for freedom, stopping traffic and alarming onlookers as it strolled through a busy road in the town of Palos de la Frontera, near Huelva in southwestern Spain. Footage caught by an onlooker on Wednesday night and posted on YouTube showed a shirtless man approaching the animal shouting "Hello... Hippo" repeatedly in a bid to get its attention. The huge beast casually stopped to nibble at some grass on the verge before being rounded and taken back to the circus. In the wild, hippopotamuses - which can weigh over 1,500kg - are considered extremely dangerous animals and are responsible for multiple deaths each year in their natural habitat in Africa. 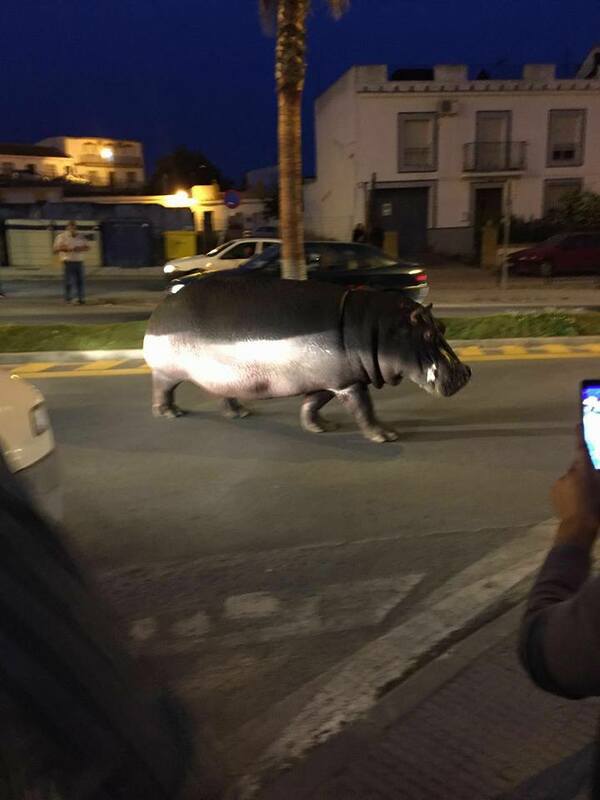 Local Police in the town confirmed that the animal had escaped due to "reasons unknown" but had quickly been rounded up thanks to circus staff, adding that the hippo had caused no damage. But the incident served to highlight the plight of animals in circuses in Spain where there is a campaign to ban them. Pacma, the Spanish animal rights party said: "Right now in Palos de la Frontera. The poor thing had escaped the circus. Legal abuse."